The following is a translation of an article/internet posting by IIm-online Nachrichten(News). 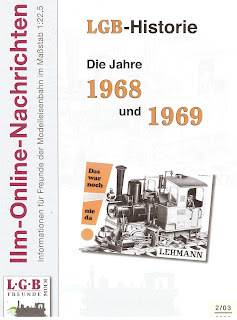 H.-Jürgen Neumann, the publisher of these News, gave Yours Truly permission for translation of these series of postings. 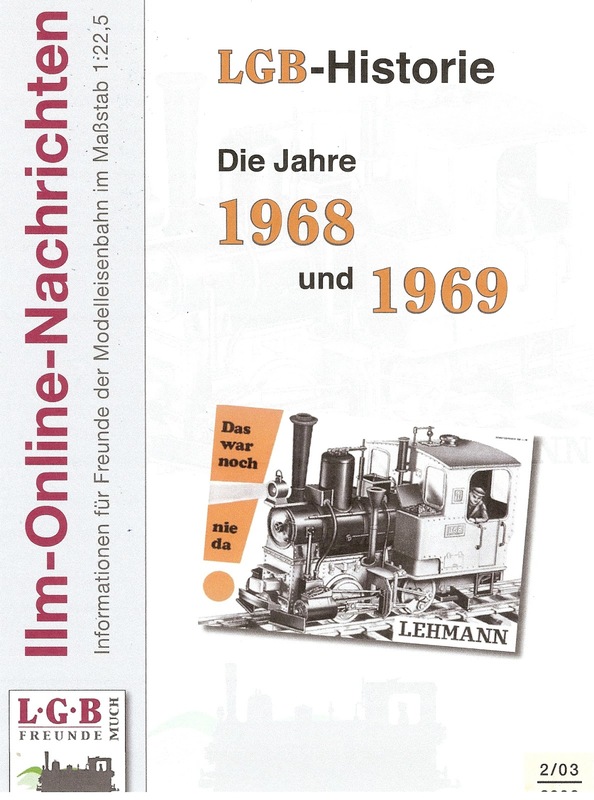 In case you like to check the original German version please go to http://www.lgb-much.de/20306.pdf. All started with the Stainz! To be exact there were 3 versions available in the beginning, in 1968. The "1", following the archetype 'Salzkammergut Lokalbahn' (LGB # 2010), the "2" (LGB # 2020) with the by now well known name "Stainz" of the 'Steiermärkischen Landesbahnen StLB (Styria State Rail, Austria) and then the "4" (LGB # 2040) which was offered as the Industrial loco of the Mining Works Siegerland,Germany. All started having a housing made from hard plastics in either black or imbued in color. originally the "1" had a green housing, the "2" a brown one and the "4" always had a black engineer housing. The respective numbering and the "LGB" on the sides or their design were not only golden colored but were made from leaf gold being steamed onto the loco. 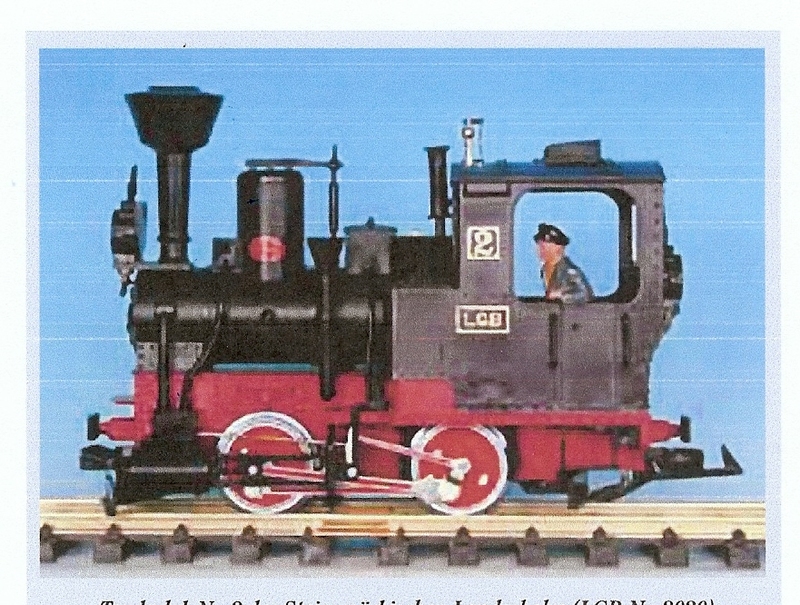 For low-priced Starter Sets slimmed-down versions were already available; the loco had no real gold signage, no loco engineer and no lighting. "The LGB loco presented here has her great archetype in the Steiermärkische Landesbahn". She was built in 1892 as loco No 2 for the narrow gauge track Peding-Stainz and was delivered by Krauss-Linz with the manufacturer's no. 2774. It is a steam loco type Bn2t, axle series B. She can take 1.15 qbm water and 0.7 qbm coal. She weighs 12 tons. This small tender loco reaches a speed of 25km/hr (=15.9 mph). Her outstanding feature is the drey shaped funnel. The amiable LGB model of this small steam loco has been replicated with extraordinary many details. The large scale delivers the incentive here. Boiler, instruments and driver's cab are made of unbreakable plastic. Take this loco into your hands without fear, nothing will break off. All metal parts of the loco are nickel-plated. "The two axles are driven by an exchangeable DC motor with 14 Volts, with a completely maintenance free, capsuled gear drive. The four driving wheels are made of brass (turned) and hard chrome plated. Push rods and accurately replicated Stephenson-control are moving in sync. Power pickup for the motor is carried out by the four wheels and fitted carbon brushes (Schnabel system). Two small loco lights, in front of the funnel and in the rear of the driver's cab glow correspondent to the driving direction.